Are you looking SSC CPO Notification 2018 ??? If yes, then here is a good news for you. Staff Selection Commission is going to conduct CPO examination for filling up 1223+ SI & ASI vacancies. SSC SI Recruitment notification is release for job in CAPF, Delhi Police and CISF department. 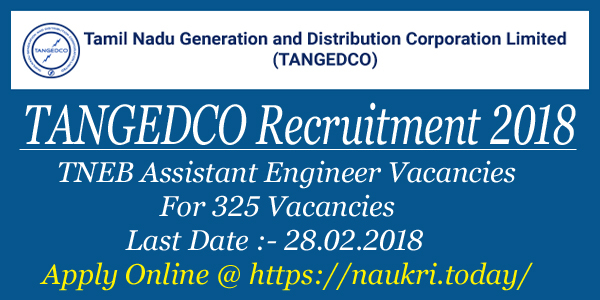 SSC CPO Vacancies online form available here or official site from 03.03.2018. The last date of apply online is 02.04.2018. Staff Selection Commission is inviting online application for SI & ASI Posts. The SSC CPO Job online form is already available for you. You can register online through given below link. SSC Group B & Group C Vacancies further details read here. SSC ASI Eligibility Criteria, Application Fees, Selection Criteria and other details, check through under information. Applicants who are going to apply for SSC Group B Jobs must ensure that they are eligible or not. Interested applicants must ensure that they are fulfill or not eligibility criteria. It comprises education qualification, age limit, physical standards etc. SSC CPO Jobs 2018 Eligibility Criteria is mention on below topics. Read carefully it before going to fill application form. Staff Selection Commission Recruitment department has decide qualification criteria as on 01.08.2018. Participants who are going to apply for SSC Recruitment must have Bachelor Degree from recognized university or equivalent. Furthermore details check SSC CPO Notification 2018. Male applicants also have MVI driving license. Age criteria is decide as on 01.08.2018. For SSC ASI Recruitment candidate minimum age is require 20 years. Applicants should not be more than 25 years. Upper age relaxation is also applicable as per govt. rules. For SSC CPO Vacancies SC/ST aspirants will get 05 years relaxation. While OBC & EX candidates will get 03 years upper age relaxation. Furthermore check SSC Group B & C Notification available on below section. 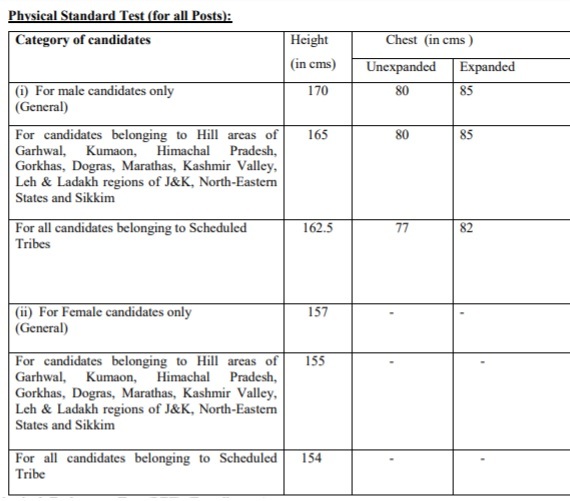 Physical Standard Test : The department is also decides PST for all candidates. Check SSC CPO Notification 2018 given PST details. 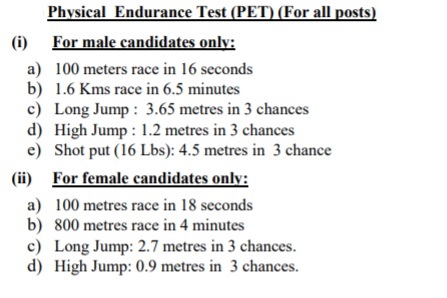 Physical Endurance Test : Check given below image SSC SI Jobs PET details. Male General and OBC candidates have to pay Rs. 100/-. Fees will pay through SBI Challan mode or SBI Net banking. For SSC CPO Recruitment you can use net banking, credit card, debit card of SBI. SC/ST/PH/EX/Woman candidates are exempted towards application fees. Assistant Professor (Executive) in CISF : Pay scale level 5. Aspirants will receive Rs. 29200/- to Rs. 92300/-. Participants selection will be made according to their performance in written examination and PST PET test. Applicants who are clear SSC CPO 2018 Paper I will call for PET & PST. After qualify this round they will select for paper –II. Then candidates can attend medical examination. After that they will call for document verification. Interested and eligible candidates may apply through online mode. Before going to apply for SSC SI Jobs, you must have scanned passport size photograph and signature. Simultaneously you may also have valid email id and mobile. Follow given blow procedure to apply for Delhi Police SSC Vacancies. First of all go to either official portal ssconline.nic.in or site . Download SSC Sub Inspector Recruitment Notification. Read it carefully and then go to apply online. 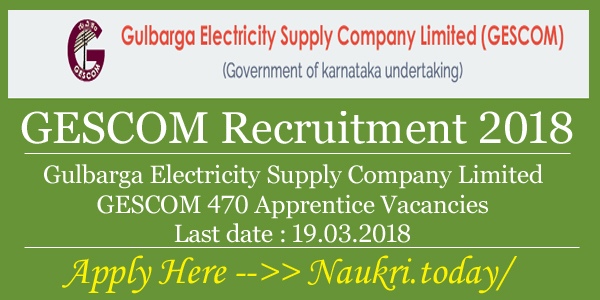 Click to SSC CPO Recruitment apply online link. First you may fill one time registration Application Form. Then go to registration part and enter all basic information on SSC CPO Jobs form. Submit all information then check SSC Delhi Police Application Form. You get a unique registration no. & password. Note down it or keep them safely. Simultaneously upload your photograph and signature. Make Payment of SSC CPO Recruitment 2018. Submit it and then take hard copy of it. You can also apply online for SSC Recruitment through direct link. Official links you can collect through given below section. 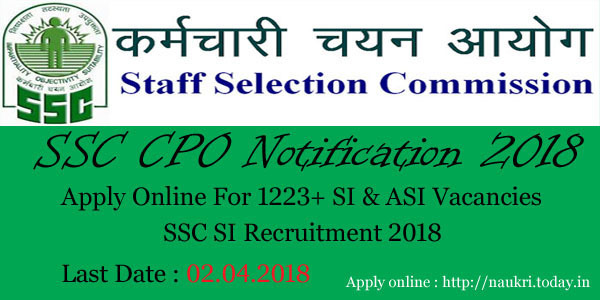 Conclusion : SSC CPO Notification 2018 has issued for 1223+ SI & ASI Vacancies. Staff Selection Commission Online Form is available from 03.03.2018. You can apply for SSC Jobs from here on or before 02.04.2018. The SSC CPO 2018 Examination will going to held on 04.06.2018 to 10.06.2018.